Is the exterior of your dirty, grimy, and showing its age? One possible way to restore your exterior to its original shining and sparkly self is with pressure washing. Pressure washing units for the regular homeowner are becoming commonplace and more affordable all the time. If your home exterior is built with materials that are safe to be pressure or power washed then continue on to learn how exactly to prepare your home for a successful and beautiful wash.
What Type Of Wash Is Best For Your Property? There are three main ways to clean and wash your house, pressure, power, and soft. Pressure uses standard water but forces it out of your nozzle or wand at a much higher rate than your regular garden hose. This coupled with the cleaning solution will blast away things like dirt, mildew, mold spores, and grime from your home. Power washing is similar to pressure, but with the added element of heated water. This helps to break down anything sticky or stuck on and can do a better job with mold. Soft washing does not use high powered water and can be done with regular water pressure. It relies more on eco-friendly cleaning solutions and a gentle rinse to clean your house rather than the power of the water. You can learn more about these techniques here. Water down the landscape surrounding your home with plain water. You just want to clean your home and make it look sparkly and just like it was when it was first built, but one easily overlooked part of the process is protecting your landscape. Most homes have at least some variety of plants, bushes, flowers, or trees close or near the home. Depending on the chemicals you are using to break down all the gross stuff on your walls, it could end up getting on the landscape you’ve carefully installed to beautify your home and end up harming or killing the plant life. By watering down the plants beforehand you can rest assured that any water with chemicals in it won’t stick to the already soaked plants and greatly reduce the chance of any damage they may receive during the cleaning procedure. Turn off the electricity that is running to any exposed wall outlets and electrical fixtures on the exterior of your home. If you have lighting fixtures you’ll need to cover each one with plastic and tape them down to keep them safe and dry while cleaning. If your pressure is high enough the water could break the glass of fixture entirely. You’ll also want to cover any patio furniture and accessories that you have near your home. Wear the proper safety equipment and utilize safe operating practices. Eye protections like safety goggles or glasses are recommended. Ear protection is needed as the machines can be loud when operating. You should always stand on the stable ground and use both hands while operating the machine and it is not recommended to use a pressure washer while on a ladder, or during periods of high wind. If your pressure or power washing unit is electric make sure all electrical connections stay dry and off the ground. Make sure you have the correct washing unit ready to go and the correct accessories and attachments for your particular set up. Confirm with the manufacturer that the model and pressure you are using will work with your home’s siding and walls. If you have a concrete driveway that you want to wash along with the house you’ll want to have a surface cleaner attachment. It’s a circular disc rather than the long hose. Using this on your driveway will make the job easier, fast, and it’s safer for your landscape. If you have a two story or more home, then it’s likely that you’ll need a pressure washing extension for your wand so that you can safely reach the higher up areas of your home. You’ll also want to make sure whatever cleaning solution you are using is safe for your walls and your paint. Always be aware of your surroundings and where you are pointing and using the pressure washer. Never point at people, animals, power lines, or anything electrical. Double check and make sure all windows and doors are completely closed before starting your clean. Once you have these steps complete you should be ready to pressure wash, power wash, or soft wash your house, depending on which method is the best fit for you. If you would like to learn more about how to clean your house with a pressure washer here. 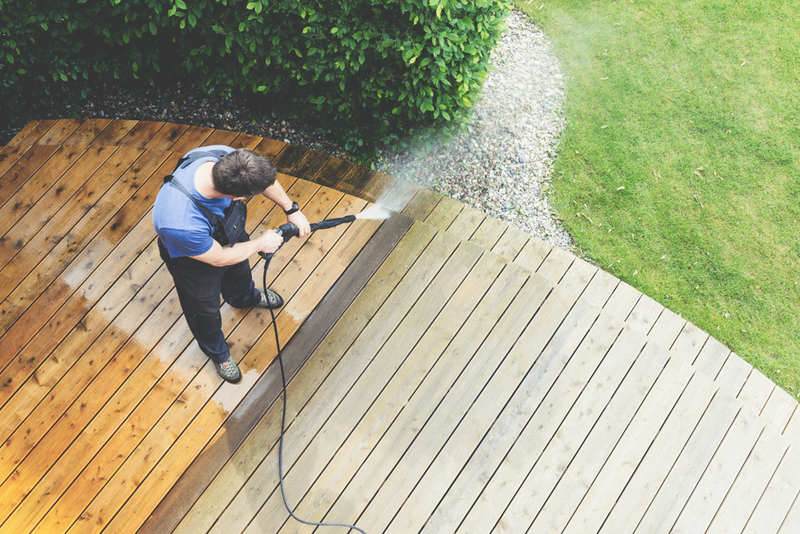 Giving your home a good cleaning isn’t the only reason you’ll ever need to pressure wash your house. If you want to touch up your house’s paint or change the color then you’ll want to pressure wash before you start to paint your house. If you don’t pressure wash before painting your house and there is dirt, debris, or mold and mildew then you run the risk of the paint not getting a complete and firm bond with your home’s exterior. Which can lead to paint peeling and not sticking and you having to put in the work to repaint your house again. What Pressure Washer Is Best For Paint Prep? There are a wide variety of different washing units on the market these days for residential homeowner use. You can learn more about their different uses here. For prepping your home before painting many recommend one that is powerful enough to cut down the amount of time it takes to clean. Smaller units can take a half day to up half a day to fully clean depending on the size of your house. PSI will be important here, the higher the PSI it won’t just be more power and pressure but the faster you’ll be able to get the job done and get right to the painting. 3000 PSI 2.5 GPM is a good size to go with that will really help cut down on the amount of time it will take to get the job done. Most pressure washers do have the ability to strip paint, and if your goal is to strip the paint off they can be a great tool for that. However, the amount of water you’ll need to use to do this can be bad for your siding. Double check your home’s recommendations before starting with a pressure wash. Some common problems that can occur are water can be forced behind your siding and the wall when improper angels are used to cleaning which can lead to mold problems down the road. Also, some types of siding and walls can have particles that are stripped or washed away during the process. Many times they are too small to notice with your eye but they do degrade the quality of the siding and will lead to it needing to be replaced sooner than normal. Keeping your distance while using a pressure will help reduce how much force is being made when the water contacts your wall. There are many benefits to pressure washing but it has to be done with caution and proper research so you don’t inadvertently damage your property. Can You Clean Your Home Without A Pressure Washer? You can use cleaning solutions and a regular hose to clean your house. However, it doesn’t do as good as a job and can take much longer to complete. Always check your siding manufacturer cleaning recommendations before getting started whether you are using a pressure washer or now so you will know what chemicals are safe to use to for your project and which way to clean will be best for your particular situation.